Well-suited for landscape and travel photography, the NIKKOR 24mm f/2.8 from Nikon offers a wide-angle field of view along with a compact, lightweight form factor perfect to walkaround use. Its modest f/2.8 maximum aperture strikes a balance between its sleek size and being fast enough for working in low-light conditions. In regard to the optics, a Close Range Correction system helps to ensure consistent image quality and accurate rendering throughout the focusing range, from 1' to infinity. Additionally, a seven-blade diaphragm contributes to a pleasing bokeh quality. Wide-angle 24mm lens is designed for FX-format F-mount cameras, however can also be used with DX models where it provides a 36mm equivalent focal length. Bright f/2.8 maximum aperture is suitable for working in a variety of lighting conditions and also contributes to the compact, lightweight form factor. Close Range Correction system helps to maintain consistent image quality throughout the entire focusing range, from 1' to infinity. Seven-blade diaphragm promotes a pleasing out of focus quality that benefits the use of shallow depth of field and selective focus techniques. Box Dimensions (LxWxH) 7.3 x 5.8 x 5.4"
NIKKOR 24mm f/2.8 Lens is rated 4.8 out of 5 by 20. Rated 5 out of 5 by George the Classicist from Fantastic Lens I have an interesting story to tell you about regarding this lens. I first bought it new in 1992, and sold it during 2004. An unwise move as I thought all I needed was the 24-50mm AFD (purchased during 2001) to cover the 24mm angle. Since 2004 I had been thinking of it, and repurchased it brand new in 2009 from B&H. I still have the 24-50mm AFD, but found it not as sturdy as I had preferred. The construction of the manual 24mm/2.8 AIS is superb. Nikon does a great job producing these classics. It is light, and takes 52 mm filters. Both are qualities if you do travel photography. Rated 5 out of 5 by Ed Passi from My most used lens in years! I have had this lens for 25 years now and still in usethe best and most useful lens ever that I have had in all my years in photography. I have used it for both hobby and professional practice and in different countries, settings, climate, and subjects. It works well with groups or individuals as foreground and with people, scenes, or objects. It's a hardy lens, sharp, and quick to handle and operate. The 52mm spec is standard for accessoriesfilters, hood, extenders, etc. I have used it with at least two different Nikon body models with consistently good results. I've used it effectively in both closeups and full-view shots. In times when I can bring along only one lens with me, this is usually my first choice, because of its superb versatility. Rated 5 out of 5 by Anonymous from An old excellant friend I've had this lens for about 30 years now and currently when I want to use my D600 as a point and shoot this old standby fills the bill to perfection. Setting the camera on manual with a shutter speed of 1/125 ap at f/8, ISO on auto and focus at about 9 feet, all you have to think about is composure. The lens has never failed to deliver excellent IQ. (Just be careful of situations where you'll encounter flare). For most general 'walk around' photography, with this lens you'll never miss auto focus. Rated 5 out of 5 by merti from Cadillac of all nikon manual lenses! This piece of equipment is unparalleled quality! There is nothing like old school made manual quality lens. This is one testimony from the 80 ies, how things were meant to be made. I was deciding between AF and this lens in 24mm focal lens. Super choice! Yes AF is convenient to have, but if you stop down to f8 during the bright day and focus at 2m, than you have everything in focus from 1.1m to 15m or if you focus at infinity at f8, you got everything in focus from 2.3 m to infinity. The clarity of this lens is unbelievable. To my opinion it is very small, light (not much heavier than plastic AF), and this lens will out lost you. It is made in Japan, no surprises in the box or on the box, none made in China signs! It is the lens as you would buy it in 1985 from Japan. Use this lens with NIKON Df.Perfect choice for street photography in tight European narrow small little streets! Rated 5 out of 5 by Bob from Beautiful lens! This is one of the classic Nikkor manual focus lenses. Wonderfully sharp even wide open, and great for low light shooting. I use it in macro photography, reversed on a PB-6 Nikon bellows and the details are simply amazing in this configuration. This is a wonderfully constructed lens with great optics! Rated 5 out of 5 by Flash from An old school lens that rocks An old school photographer friend talked me into buying this lens, and it is now my favorite Nikon lens. I like to shoot close foregrounds against interesting backgrounds. This 24mm somehow has the ability to make the close foreground look natural and not distorted while allowing the background to contribute in a robust but integrated way. For example, this lens is great for a portrait in which the subject stands on a garden path that leads back and out of focus. On my full frame camera, an old F3, perspectives are stunning. On my D300, I mostly shoot in aperture-priority mode, so the lack of auto-focus doesn't bother me. I'll even go one step further: it is a good thing that this lens is not AF because it forces you to think about how you're casting foreground against background. A few quick extras: bokeh is buttery and beautiful, colors are rich and contrasty, near focus goes to just a few inches, the focus ring feels great and has a very long throw, the barrel is straight and compact, and it has a nice balance on a mid-size DSLR. I waited for over a year for my lens to come into stock. Because they're still in the catalog, I figure that Nikon makes a batch from time to time. Be patient. Rated 5 out of 5 by Pat the bat from Amazing wide angle I mounted the 24mm lens on my Nikon FM film camera and the image quality and clarity is by far superior to my previous prime lenses. Perfect for landscape shots and is a durable piece of glass. No problems so far. Would definitely recommend to beginners and professionals alike. Rated 5 out of 5 by Anonymous from Nikkor superb manual wide angle This is an amazing manual focus lens. I use it with the FM3A camera. The sharpness is excellent, the contrast is wonderful but the thing you can't find anymore on lenses is the quality. All metal construction, creamy soft focus ring, very small and light. I am a Canon user since 1995 but Nikon did make fantastic manual focus lenses. It is hard to find these lenses now a days so a big thanks to B&H Photo for having them in stock. 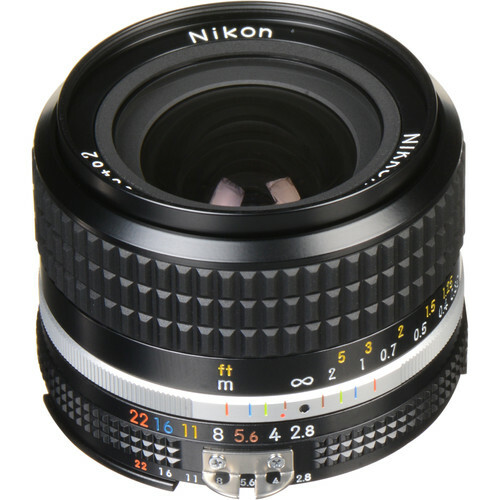 What is a suitable Hood for the 24mm Nikkor AIS lens that will not create vignetting at any aperture? The Vello 52mm Snap-on Tulip Lens Hood (Version II) will not cause vignette on the Nikkor 24mm f/2.8. I have one of these left over from my old film days. Will this work (obviously in manual focus mode) on a D7200? Thanks. Yes, this lens is compatible with the D7200. I intend to use this lens with the Metabones Speedbooster and that combination does not always work when parts in the rear sticks out too much. Is it possible to see some pictures of the rear without cap? This is a full frame lens, so it will be compatible with a Speedbooster style adapter. Does this lens work on my fm2 camera? Is Nikon still making these AIS lenses or is it old stock that hasn't been sold yet? Yes, Nikon is still making several AIS lenses. Answered by: Gudrun R. T.